This plaque tells of the death of the Marshal of Gravity, Aocwatt Stciwne, by the gun of Mdeu Hayz. It’s unusual because guns are not absent, but relatively rare in Kcymaerxthaere. Created by Geographer-at-Large Eames Demetrios, the Kcymaerxthaere project divides what we call the Earth in a system of 29 major rezhns as part of a global work of multivalent storytelling. It has been likened to a novel with every page in a different place. As Demetrios has said, Kcymaerxthaere is a “parallel universe that intersects with much of our linear Earth, but with different stories, creatures, peoples, even laws of physics and qualities of existence.” What makes the Kcymaerxthaere project particularly interesting is that Demetrios installs informative markers and historical sites at the locations in our world that connect to his world, about a hundred real-world intersections with his imagined universe. Strangely, this plaque was diverted by renegades, but we have found it again and it has now been installed by leading Kcymaerxthaereal scholar B. Mayer. It’s also worth calling attention to the fact to the language spoken here was Deralkohn (pronounced like a small quartzite rock falling from a height of about three feet into a pile of crushed marble), one of the exquisite languages requiring the speaker to have an almost unlimited to ability to create sound effects. 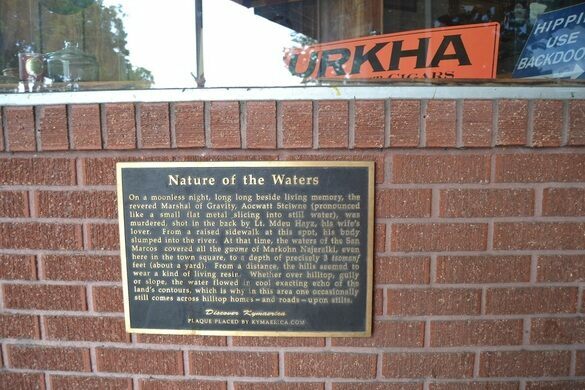 Plaque is located on the Town Square of San Marcos. It is on the front of Hill Country Humidor Be sure to take a look around inside--pretty amazing world whether you are a cigar person or not. The home studio one of Britain's first independent record producers is also the site of a murder-suicide.